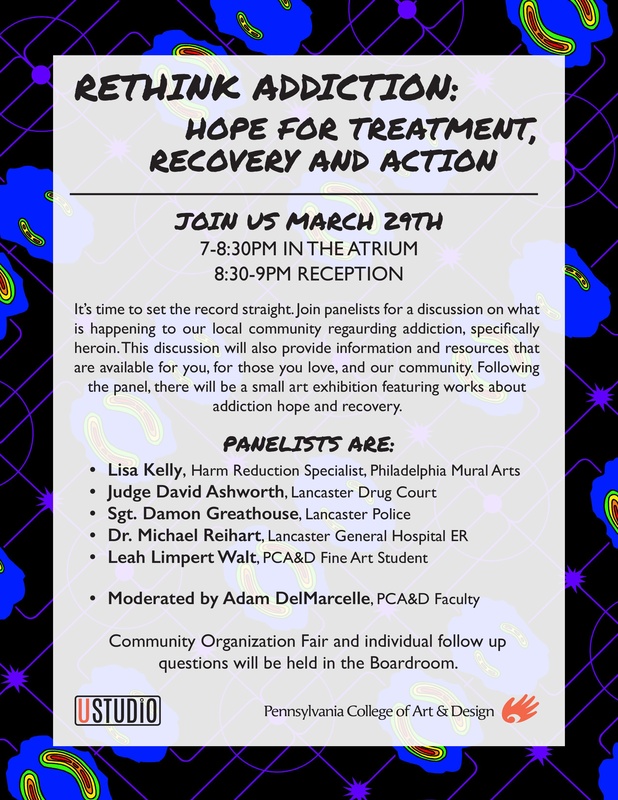 Please join PCA&D on Thursday, March 29th at 7pm, for a very important event: Rethink Addiction, a panel discussion about the current climate around the heroin epidemic. The panel is comprised of a spectrum of perspectives on the issue and will be discussing the laws and procedures put in place to battle the epidemic, the facilities and programs available for those suffering, how art can play a part in community outreach, and what recovery looked/looks like for one individual. Rethink Addiction Artwork by Kathrun Mikus, Illustration Junior; animated by Simone Saunders, Digital Media Junior. Muralist Lisa Kelly - Harm Reduction Specialist, Philadelphia. Lisa Kelley is an artist working for social change. Her current body of work (Epidemic) was developed because of a need to tell a story, and to help others find their voice. She is interested in exploring the stigma and shame surrounding addiction, telling the stories of hope, loss and love and connecting those affected. Lisa teaches free art workshops in the Kensington neighborhood of Philadelphia, in the heart of the open air drug market. Her classes are often attended by people who are homeless and/or in active addiction. She believes in the power of art to build community and create change. Judge David Ashworth - Lancaster County Drug Court. Judge Ashworth was elected to the bench of the Lancaster County Court of Common Pleas in November, 1999. He is a Senior Adjunct Professor at Franklin and Marshal College and a Drug Court Technical Consultant with the Federal Bureau of Justice Assistance (BJA) in cooperation with American University. He is a member of the National and Pennsylvania Associations of Drug Court Professionals (NADCP & PADCP). In 2010 he was elected to a two year term as President of PADCP. He served as a member of the Statewide Drug Court Accreditation Committee by appointment of the Supreme Court of Pennsylvania. In January 2012 the Lancaster County Court of Common Pleas Adult Drug Court became the first Accredited Drug Court in the Commonwealth of Pennsylvania. Sgt. Damon Greathouse – City of Lancaster Police Department. An army veteran, Sgt. Damon Greathouse has been with the Lancaster City Police Department for 22 years serving in a variety of rolls, which included being one of the original members of the Selective Enforcement Unit (SEU) where he was deputized as a Federal Agent with the Drug Enforcement Agency. Since September 2014, Sgt. Greathouse has been the supervisor of the SEU where he works with state and federal agencies to identify crime and narcotic trends in the city, supervises and participates in drug and criminal investigations, as well as works to establish and implement crime reduction strategies with his team. Since 2017, Sgt. Greathouse has also been an active member of Project Lazarus, a community think tank of community stakeholders who are seeking ways to prevent the addiction spiral and overdose deaths. Michael J. Reihart, D.O., FACEP - A Lancaster General Hospital Emergency Room Physician who lives in West Hempfield, Lancaster County, PA with his wife and 3 children. Dr. Reihart is an Attending Physician and EMS Medical Director for Lancaster General Health, Lancaster, PA, a Level II Trauma Center. He is also the Regional Medical Director for South Central Pennsylvania Emergency Medical Services encompassing eight counties and a population of over 1 million people. Recently, Dr. Reihart assisted the District Attorneys and all Lancaster County Law Enforcement agencies to initiate their Narcan program. The Law Enforcement Narcan program has already saved over 25 lives in the past two months. Leah Limpert Walt - PCA&D Fine Art Senior, with personal experience of the recovery journey. Leah is an artist and a recovered heroin addict of close to 6 years. She has first hand experience with addiction, treatment, recovery, and the facilities and programs available locally for those suffering, as well as a perspective on the personal hurtles one overcomes in the process. Leah is also a non-traditional 31 year old Fine Art Senior at Pennsylvania College of Art and Design. Her work tends to reflect her experience with this huge life event, delving into mental health, trauma, nature vs. nurture and lineage by employing symbolism, realism and color interaction. Leah has shown in Harrisburg, Lancaster, York, Bethlehem and New York City. She was featured as one of YRK Magazine’s Emerging Artists for 2017 and was a presenter at the York: Crafted PechaKucha event in January 2018. Panel Moderator: Adam DelMarcelle, a PCA&D faculty member whose artwork addressing the opioid crisis hands is in the National Archives, will be moderating the panel. Adam DelMarcelle serves as an adjunct professor at Pennsylvania College of Art and Design, York College of Pennsylvania, Lebanon Valley College, and Kutztown University, teaching courses in graphic design, illustration and printmaking. His current work focuses on design activism and the role design thinking plays in solving larger societal issues. The work created for the “What Heroin Sounds Like” campaign has garnered national attention, allowing Adam to travel widely spreading awareness of the heroin and opioid crisis ravaging our communities. He holds a BFA from the Pennsylvania College of Art and Design and an MFA from the Vermont College of Fine Art. DelMarcelle has prints in the permanent collection of the Library of Congress and The Cushing Whitney Medical Library at Yale University. This panel is a community event, not just a PCA&D event, and members of the community are encouraged to attend. The event will be held in the PCA&D Atrium, 204 N Prince Street, Lancaster. This discussion will also provide information and resources that are available for you, for those you love, and our community. Following the panel, there will be a small art exhibition featuring works about addiction hope and recovery. This Addiction Panel has been organized as part of PCA&D’s UStudio programs, offering students tools to develop skills relating to personal safety, substance abuse prevention, and healthy living, in order to inform and support students and the community at large during the ongoing opioid crisis.